I. Addresses at the opening session. II. Taxonomy III. Morphology and morphogenesis. IV. Biology. V. Ecology. VI. Palaeoecology. VII. Deep sea Ostracoda. VIII. Biogeography and palaeobiogeography. IX. Speciation. X. Evolution. XI. Biostratigraphy and exploration. Genera and species index. General and author index. There are many competitive works on the market concerning evolutionary biology, but this volume is quite distinctive in its idiographic aspect focusing on Ostracoda viewed from a wide range of disciplines, ages and environments. The book deals with various lines of idiographic biology and palaeontology of Ostracoda and nomothetic trials focusing strongly on evolutionary biology. Particular themes are morphology, biology, evolution, speciation, ecology, palaeoecology, deep sea fauna, biogeography, palaeobiogeography, biostratigraphy and exploration, all concerning Ostracoda. 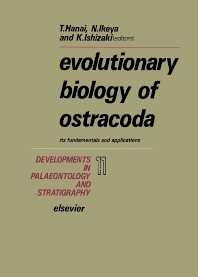 The last decade has witnessed a spectacular renewal of interest in the study of Otracoda, particularly in the evolutionary biology of Ostracoda, including speciation. Ostracoda are unique, ranging in age from the Cambrian period to modern times with carapaces ready to be preserved as fossils, providing various lines of invaluable evidence regarding evolutionary processes. More than 120 participants from 20 countries assembled at the Ninth International Symposium on Ostracoda and this book is a collection of all the papers presented at the Symposium, plus selected papers submitted by non-attending members. It presents an outstanding record of much pioneering research and will be of interest to specalists in Ostracoda as well as all earth and life scientists concerned with evolution. Its value is further enhanced by easy-to-use indexes of authors, localities and taxa.